When a combination of futures and option make up the legs, the Price and Delta fields become enabled for the futures leg and Covered is displayed as the strategy type. When a strategy is configured for only options, Combo is displayed as the strategy type. Note: Strategy creation is not available when running X_TRADER in simulation mode. However, you may access and trade all strategies that exist in the production markets. From the Control Panel, click the Window menu and choose Create Strategy. 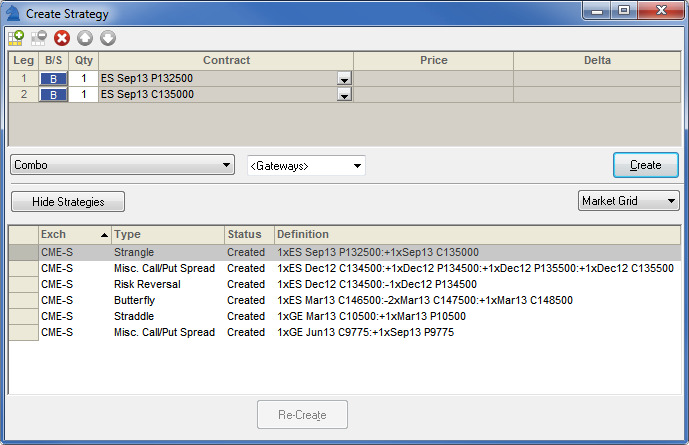 Select the desired contract(s) from the Market Grid and right-click to access the context menu. Click Create Strategy. From the Market Explorer select the desired contract(s) and choose Create Strategy. Click the button to add a leg to the strategy. A new leg appears in the Strategy Creation pane. Click the down arrow in the Contract column. The Instrument Explorer dialog appears. Select the desired Market, Product Type, Product, and Instrument. Click OK. The contract is added to the leg. Repeat steps 2-5 to add additional legs. Edit the legs as appropriate. Click B/S to toggle between Buy and Sell. Change the Qty field per leg where permitted. Enter a Price and Delta per leg where permitted. Note: If you are creating a strategy for SFE, you must add a price to each leg in the Price column. Click the down arrow to the left of the Create button to select a Strategy Type. The new strategy is created and appears in the top row of the Saved Strategies List.